in clover: happy new year! First, today is Chinese New Year. We don’t necessarily celebrate the day itself, except by lighting lots of candles but every year I do prepare by cleaning and decluttering our house. Doing so is supposed to sweep away any accumulated bad luck. Superstitious, you might say, but I enjoy the ritual. Plus, it's nice to get a second chance at starting a new year...I'm never ready on January 1st. And a clean house never hurt my feelings either. Today is also my Dad’s birthday. That’s a great reason to celebrate. Happy birthday, Dad! Both big occasions, but there is a third reason we are celebrating Life today. Some of you may not know that when Little C was born, she was diagnosed with a condition called hyperinsulinism. After two months in three different hospitals and one amazing surgery at the amazing Children’s Hospital of Philadelphia, she was cured. Then, when she was about two years old, Little C had a seizure. We did not see the seizure but she threw up and was very tired and lethargic…her preschool teacher reported that “it” was going around. A few hours later, she was up and running around…feeling just fine. We thought it was a 12 hour bug. I have a photo of Caroline on the day of her first seizure because it was Halloween. 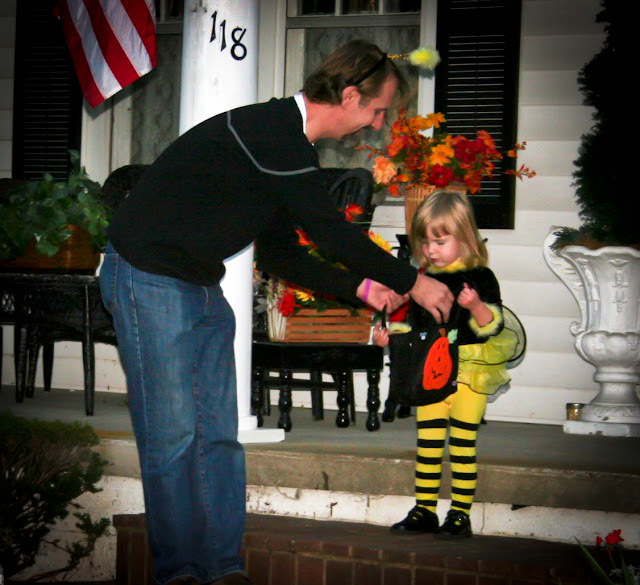 She missed her preschool party but we allowed her to don her bumble bee costume and go trick or treating with friends that evening as planned. We learned that there are many reasons why someone might have a seizure. Some are linked to other medical conditions but many people suffer seizures for no known reason. When that happens, doctors call it “epilepsy.” No one could say for sure why Little C had that seizure. Wait and see, the doctors said, but lying in bed with her that night, I remembered what had happened on Halloween and when I told the neurologist about it, he recommended we start Little c on anti-convulsant medications. Seizures are defined as excessive surges of electrical energy emitted in the brain. They are most often treated with powerful anti-convulsant drugs. In the broadest of terms, most seizure medications work by slowing brain function. 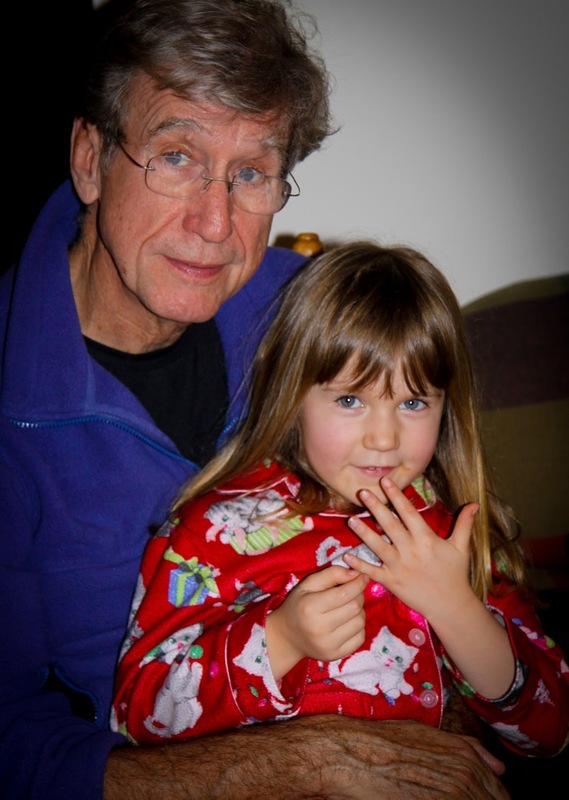 We tried numerous medications and combinations of them as well…we had a two year goal. If we could keep c from suffering a seizure for two years, the neurologist told us, we could discontinue medication and most likely c would remain seizure free. When he first told me this, it sounded like the perfect plan. I had no doubt the medication would work and that c would be medication free when she entered kindergarten. But that is not what happened. Despite multiple medications, she had a seizure about every 6 months. Each time, we would start over with a new drug and a new dosage….still focused on that magical, ever moving, two year mark. And she still had seizures. Having never questioned the need for medication, Michael and I began to wonder if the side effects of the medications were outweighing the seizure risk. I want to be clear here. Our daughter was not having daily, weekly or even monthly seizures. There are people who suffer seizures far more often and must be on medication and may even have brain surgery. Every person with epilepsy is a unique individual. For many, not taking medications is just not an option but when I asked the neurologist if c would have seizures more often, if she stopped taking medication, he told me he did not know. Michael and I decided it was worth a try. We also felt that if we were taking the drugs away, it was important to support c in other ways so we did a lot of reading about alternative “treatments.” We read that some research shows that children with seizure disorders who live with a canine companion have fewer seizures than children who do not. So, we got a puppy. 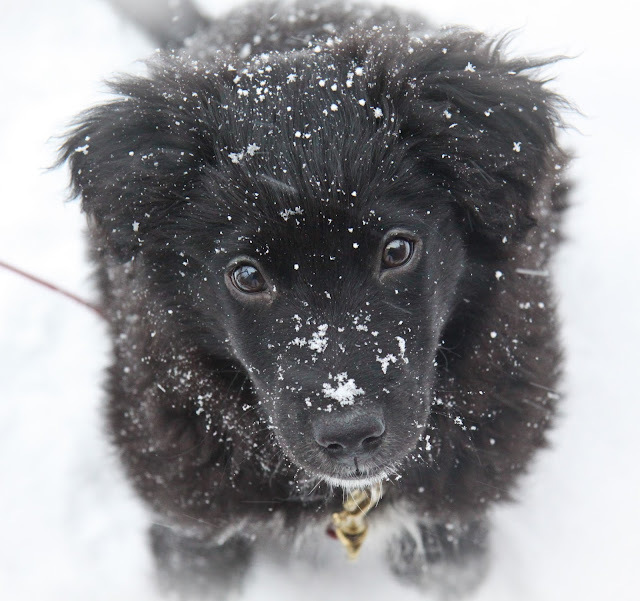 I took this photo not long after we brought him home...I call it "Harper on a Snowy Day." We read amazing stories about service dogs, trained to alert their humans to an impending seizure. Many people are injured or killed when they have a seizure, not from the seizure itself but from falling in a bathtub or down stairs. We found out that there is a woman, right here in our own area, who trains these highly specialized service dogs. I had visions of Little c and Harper riding the school bus together. It was not easy to leave the pharmaceutical road for the one less traveled. People I love and admire for their intelligence disagreed with us…and they said so, vocally. For months, Michael and I held our breath…would today be the day a seizure came? We prayed and we hoped for the best. We timed ending c’s medications with the summer break from school…that way, if all hell broke loose and she was suddenly seizing more often, she would be with us. You cannot abruptly stop taking anti seizure meds. You must “step them down.” Just a few days after c took her last dose, she and I visited a friend’s antique shop. My friend’s elderly dog greeted us at the door. Little c was instantly engrossed in petting and talking to the dog, totally ignoring my friend and me. But when I told her it was time to go, c looked up at my friend and said, “I love your dog. I have a dog too. We got him because I was sick….but I am not sick anymore. I’m all better now.” My friend smiled and c and I returned to our car where I buckled her into her backseat booster seat. Before putting the car in gear, I sat for a moment…thinking about what had happened. There was a feeling beyond the words…an energy I could not name. It felt like a whispered encouragement. It felt….divine. We had not told c why we adopted Harper the Dog (as she calls him now) or that we hoped to train him as a service dog but we didn’t keep it a secret either…I’m sure it’s quite possible she overheard me telling someone else…but in the medicated state she was in at the time, I cannot imagine she would have been able to process what we were saying. From home I called a friend. I didn’t tell her how it FELT but I told her what c said. I don’t remember exactly what she said…in fact, I think there was mostly awed silence and maybe a heartfelt “wow…..” We both agreed that c had pronounced herself cured. For months after that, when I got scared…if c was slow to wake in the morning or seemed the least bit off….I would remember what c said and I would feel comforted. If someone expressed skepticism for what we were doing, I would remember how I felt that day and I would feel comforted. Oddly enough, in addition to the photos I have of c on the day of her first seizure, I also have photos of c on the day of her last seizure. I have photos of that day because the last time c suffered a seizure was on my Dad’s birthday…..two years ago, today. As of today, January 23, 2012, c has finally reached that magical, elusive mark....she has been seizure free for two years and without meds for 20 of those months. I do not know why c said what she said or why I felt the way I felt. I do not know why she stopped having seizures or why the medication did not work for her. Last year, on my Dad's birthday I told him that I didn't know if having a dog had helped c or not. He said he thought we should go with "yes." but I am grateful to stand in this beautiful space of Mystery…this Sacred Not Knowing…with my daughter. She has brought me here more than once. Celebrate today with us! And Happy New Year! Suscribe by email below. You'll receive an email when a new post appears. Copyright © 2011, readinclover.. Ethereal theme. Powered by Blogger.